Do you want to host a great webinar? Webinars can be a wonderful tool for leading courses and sharing information with your clients. They also give you an opportunity to show off your expertise as an authority in your field. What do you need to host a webinar? Having a good set of equipment can help with the overall quality of your presentation. At minimum you will want to have a good microphone or headset so that your listeners can hear clearly. Preparing backup equipment can also be helpful when an issue happens. Most importantly though is the platform that you use to host the webinars on. There are many paid and free options available, and choosing one can be overwhelming. Each software will have features suited to different types of users. Here are fourteen webinar hosting options with features that may be suitable towards your needs. GoToWebinar is a versatile option for companies that need something easy and stress-free. Whether you’re new to hosting webinars or you’re a seasoned pro, this software can make the process more streamlined. It can provide you with support before, during, and after the webinar event. GoToWebinar is a very popular option among companies of all sizes. The masterminds behind the software also own LogMeIn and GoToMeeting. The developers have over a decade of cloud-based collaborative services under their belt, so you can rest assured that GoToWebinar is up to par. The software is very versatile and allows you to be as hands-on as you please. Before you the event ever occurs, you have flexible scheduling options to ensure that your target audience has the chance to attend. GoToWebinar can also take care of promotions. You’ll be able to customize marketing materials, registration information, and so much. With its integrated CRM, you can easily reach your target audience. When it comes to the quality of the webinar itself, GoToWebinar is quite impressive. This is not your boring old web presentation. Webinars can be fully interactive, complete with engagement tools, webcam capabilities, surveys, and more. Even if you decide to do a pre-recorded event, the accessible technology behind the software allows you to create an immersive experience that feels real and in the moment. Plan pricing for GoToWebinar is very similar to other options on the market. However, GoToWebinar offers many innovative features and the ability to support more viewers at one time. The software is available in three different plans. Each plan can be purchased at a monthly rate or an annual rate. If you choose to get billed annually, you can save up to 20 percent over the course of the year. GoToWebinar does offer a seven-day free trial so that you can test the software before you commit to a plan. The most basic plan, called the Starter Plan, has limited features. It does not have custom event URLs, video sharing, source tracking, or the ability to record events. However, it does include analytics automatic branding, CRM integration, and all of the other great core features. The Starter Plan can support up to 100 participants in a single event. It costs $109 per month. With the annual subscription, monthly costs come out to $89 per month. The Pro Plan includes all of the features that GoToWebinar has to offer. With this plan, you’re getting three customizable channel pages, custom URLs, use of an intuitive video editor, and more. This plan can support up to 500 participants per event. It cost $249 per month. For the annual subscription, this plan cost $199 per month. Finally, there’s the Plus Plan. The Plus Plan includes five customizable channel pages in addition to all of the previous features. This plan will cost you $499 per month, or $429 per month if you pay the annual rate up front. Who is GoToWebinar Good For? GoToWebinar is a great option for small and mid-sized companies who want a bit more control in how their webinar looks. While the software has many templates to make quick presentations, it offers plenty of flexibility to make it your own. This is great for businesses that want to establish their brand identity from the moment a participant learns about the event. The detailed metrics can also help growing companies adapt to the needs of their target audience and see further success. ClickMeeting gives you the option of customizing the appearance and branding of your webinar to match your existing business. The registration page, waiting room, email notifications, and webinar can be customized with your own branding. Webinar invitations can be customized to include the webinar agenda, formatted to a email template, and include a registration button and additional information to make it easy to sign up for your webinar. This can be done either on your desktop or the mobile app since they both allow full control over running your webinar. Moderated chat feature helps you engage with your audience. You can manage the feedback and reactions in real-time. The chat function allows you to accept, reject, or edit comments before the rest of the audience views them. 13 language interface options. This helps you work with attendees from around the world. The chat function also utilizes Google translate to provide instant translations during the chat. Interactive webinar room provides tools for document and screen sharing, whiteboard functions, along with polls and surveys to engage with your audience. Analyze webinar summaries, attendee stats, and attendee ratings with the reporting functions of the software. One click recording options. You can download recordings into a MP4 format and store webinars in the cloud. Redirect your attendees to a custom webpage after the webinar. This can be a call to action, a place to provide additional material, and make an overall final impression to your attendees. Share webinar invites on Facebook, Twitter, and LinkedIn. Add functionality with connected apps that can help you manage files, scheduling, leads, and prospects. 30 day trial, $25 per month paid annually for 25 attendees. Yondo works as a full video ecommerce platform for hosting your webinars. This can be a good option if you have a library of videos/webinars to offer your customers. One advantage of Yondo is that you have several options to monetize the webinars. If you have an existing website, Yondo can be integrated into your website to offer webinars to your customers. Alternatively you can utilize a custom landing page to provide a central location for registration. You can utilize a call to action tool to add a call to action at the end of the video or on demand during a webinar. You can customize the call to action with a title, images, custom text, along with button and links for your customers to click on. Create preview videos to give your attendees a sample of your on-demand webinars. Add team members to your account so that they can help manage your webinars. Your customers can book 1-1 sessions based on your availability. Booking is displayed in their local time zone based on your availability and can sync to multiple calendars. Integrated system allows you to view and chat with attendees, trigger call to actions during a webinar, and manage the screen, camera, audio, and recording options. You can also share items from your screen or link documents and other items. Live webinars can be recorded at ay time and the recordings can be added to your video on demand library at any time. Host up to 1,000 attendees on each of your webinars. Your attendees can sign up from a customized landing page that includes your branding and domain. Yondo integrates with Stripe and Paypal to accept payments. You can set up different monetization options including monthly subscriptions, one-time purchases, and pay per view rentals. Analytics dashboard gives you live event stats and customer information for follow-up. Create video courses for your website including resources that you can share as attachments to the webinar. Subscriptions start at $47/month for 25 attendees and there are discounts for paying annually. Hangouts Meet is the business-centered version of the Google Hangouts app. Meet comes bundled with Google’s G Suite, and has different features that appeal to webinar use. G Suite comes in three pricing packages ranging from basic up to the Enterprise option. The main difference for Meet is the number of participants, and recording options. Here are some of the features available on Hangouts Meet. For the Enterprise version you can record your webinars straight to your Google Drive in a special Meetings folder. This can be helpful if you want to share the webinar with participants that couldn’t attend the session, or review them yourself for finding ways of improving them in sped-up mode. The Basic and Business editions of G Suite can support up to 25 participants. If you plan on having more participants to the webinar, you can switch to the Enterprise version to host up to 50 participants at a time. Video and voice options available for your webinar. You can share documents, spreadsheets, and slides with participants with just a couple of clicks. Built-in invite integration with your Google Calendar. Hangouts Meet becomes a default conferencing option so that you can schedule and invite people to your webinars. The calendar will automatically generate a Meet link for your event, and you can modify guest permissions from the event page as well. $25 for the Enterprise edition. The structure is set up to where you can upgrade/downgrade between editions. Blackboard Collaborate is a webinar/web conferencing program designed with educational use in mind. Blackboard can tailor the webinar solution options to specific business, government, or educational institutional webinar needs. Collaborate allows you to create and schedule sessions for your webinar from within the interface. From here you can set up roles for participants beforehand, or make adjustments during the session. Blackboard does point out that the session links are generally long, so you may want to use a url shortener to make it easier for your participants to join. Collaborate allows for session sizes of up to 250 participants. Larger groups can be accommodated by contacting Blackboard. With larger groups, features such as breakout groups and participant settings are turned off. You can also record webinar sessions that capture audio, video, and shared content. You can also set it up to that recordings can be downloaded by participants. View attendance reports to see which webinars have attracted the most participants. Integration with PowerPoint and Openoffice to help lead training sessions. Breakout groups allow you to put participants together for group activities. This can be a useful tool for implementing participant interaction. Free 30 day trial. Pricing available by contacting Blackboard. 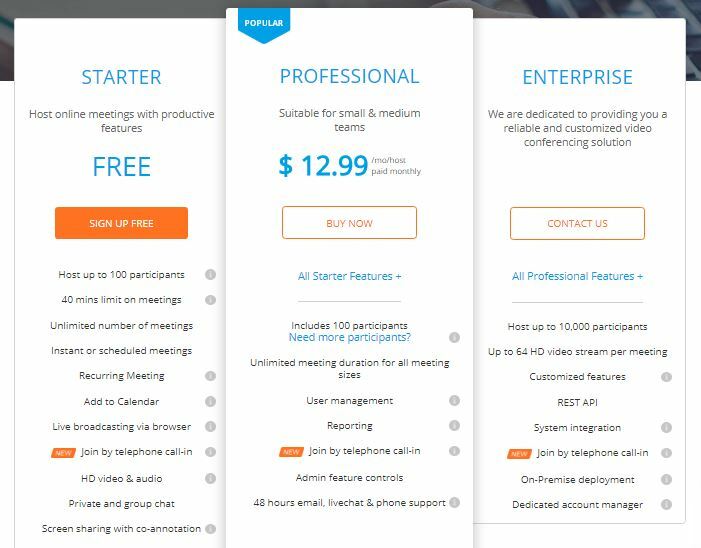 AnyMeeting provides webinar services tailored for small businesses. If you’re leading a small webinar (up to four attendees), you can set up a free webinar account. Using this option allows you to do live presentations where you can share your screen, audio, and video. You can also utilize the chat function to field questions from your audience. At the end of the webinar you can redirect your participants to a specific url once the stream has ended. This can be a helpful option for providing an exit survey or a redirect to a call to action page. With the free account option, you will need to upgrade your account to host more attendees, record webinars, and gain access to additional tools that can be helpful for your webinar. Customizable registration forms. You can select which fields to include so that you can tailor the marketing information gathered. International dial-in options available. Attendees can join by phone for instances where their internet connection isn’t optimal. Q&A session tools available. Audience submitted questions appear on a separate tab, and you can display the question to the attendees when you’re answering the question verbally. Set up a webinar series using the scheduling tool. Your attendees can do a one time sign up for the whole series, or you can require them to sign up for each webinar separately. Library of reporting tools available. You can see data on the performance of the webinar, attendance, chat logs, polls, and other data that can be exported in csv format. Recording options that allow you to download the video in MP4 format. Up to 1,000 attendees per webinar. Facebook and Twitter promotion tools. Free for up to 4 attendees. Professional version pricing starts at $78/ month billed annually for up to 100 attendees. ezTalks can be a good platform option if your webinars have a shorter duration. Currently the free option limits the duration of your webinar to 40 minutes which can be a good time slot for a half hour webinar. ezTalks doesn’t limit the number of webinars you can schedule, so you can run multiple webinars on a given day. Another aspect of ezTalks is the integration of their mobile and desktop apps. Some features such as calendar syncing, and polling tools are only on the app version. Recording options on the other hand are only on the desktop side. In terms of the features, the developers placed them on the platforms where they could be used the most rather than trying to mirror the same experience on all platforms. Participants can join your webinar by phone. When sending out invites, the template will list a number that they can join by audio for instances where their data connection may not work as well. This was a recent addition added to the platform. Your webinars can have up to 100 participants during a session. There are several paid options available if you need to increase the number of participants. You can utilize multiple screens during a webinar. This can be useful if you’re doing a slide presentation during the webinar and need to prepare items off on a second screen. Scheduling and calendar tools integrated into the mobile app. If you use your mobile device for scheduling meetings frequently, these tools in the app can be useful in managing your webinar schedule and make sure that everything is viewable on your calendar. Unlimited number of webinars with 40 minute durations. ezTalks gives you the option of other package options that remove the duration limit if your webinars are longer than the time frame. Invitation tools that integrate with your existing email client. The invite tools has a template built in that allows you to share information to your participants about joining the webinar. All you need to do is fill in their name and email address, along with anything else that you want to use to personalize the invite. You can also paste in email addresses to send out invites without leaving the software. There are also options for copying the link and info for social media or SMS options as well. Free for 40 minute duration webinars with up to 100 participants. Professional plans with no duration limits start at $12.99/ month for 100 participants and can be upgraded to up to 500 participants. There are discounted options available as well for yearly subscriptions. ReadyTalk is designed for webinars that don’t require live video. This can be a good option if you have attendees that want to dial in using a phone. When setting up a webinar, you can choose to allow VoIP audio, streaming, or toll audio by default. This will allow attendees to connect by either phone or computer. One thing to consider with ReadyTalk is that it is Java-based, so you will want to make sure that the plug-in is installed prior to starting your webinar. Once you’ve opened the panel, you can add your Powerpoint, polls, and video so that its ready for your presentation. Android and iOS apps allow you to run the webinar without using your desktop. Customized email invites. You can import a csv contact list to send out invites to your contacts, and the software integrates with your existing calendar. Send out Facebook and Twitter invites so that participants can sign up for your webinar. One-click recording options. YOu can download a recording in the standard formats, and can use the recording for a future recast. Comprehensive reporting features to gather marketing data on your participants and follow up with them. Marketing integration includes Salesforce and HubSpot. Open API allows you to use custom integration options. Add polls, surveys, and Q&As to your presentation to help with attendee engagement. Custom brand heading. Reminder emails can have attachments such as a copy of the webinar attached as a thank you email to your attendees. Starting at $119/month/user paid annually for up to 149 participants. 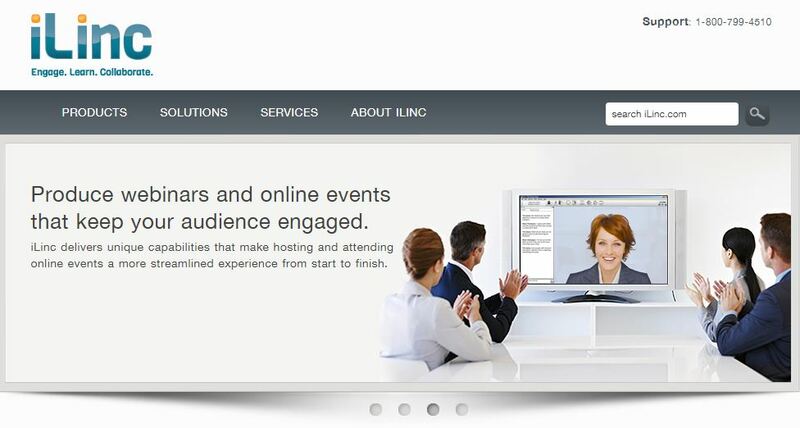 If you need to host a webinar for a large audience, iLinc For Webinars may be a good option. Many of the features and services offered are geared towards providing a large scale presentation. Not only can you host up to 1,000 participants, iLinc also provides session management services and tools so that others can help manage your webinar. iLinc can also be useful if you want to manage all aspects of the webinar from a central location. There are tools available to help with registration, webinar/attendee management, and after session follow-up. You can also cast the webinar with others in a panel/multiple speaker style format. iLinc is designed to have easy to use recording features. You have the option of having the webinar auto record. The recording option is done on the server-side so that the performance of your system isn’t affected during the webinar. Centralized registration portal. A single link can be provided, or integrated into your website to allow people to sign up for your next event. You can utilize the iLinc registration portal, or work with them on creating a custom solution. Integrated polls and surveys during and after the webinar. These can be questions that you prepare beforehand, or in the middle of the presentation to re engage with your audience and get feedback on your performance. iLinc integrates the registration process with social media sites like Facebook and Twitter to direct people to sign up for your webinar. You also have more traditional options that include email templates. Integration with salesforce.com. The system automatically updates your contact list when a participant registers for a seminar, and stores the information as a new lead. Automated confirmation and follow-up communications helps to remind your participants of the upcoming webinar. After the webinar, you can provide them with a follow-up email that can include a call to action. Free 15 day trial. Contact iLinc for pricing options. Skype for Business comes bundled with Office 365, and can be a useful platform for hosting medium to large scale webinars. Skype for business allows you to have up to 10,000 viewers at a time by using Skype Meeting Broadcast. Skype Meeting Broadcast is your starting point for setting up and scheduling your webinar. From here you can select recording options, add event team members, and send out invite links through Outlook. Skype Meeting Broadcast is designed to work with your other Microsoft programs. Producers can help the presenter by managing audio and video sources, along with loading the Powerpoint slides. This role gives them control over what the audience sees during your webinar. One example would be to allow your audience to see the Powerpoint presentation while still hearing your voice. Interact with your audience using Microsoft Pulse. This can be enabled in Skype Meeting Broadcast so that you can post questions and polls to your audience and get their responses. These questions can be loaded before or during the webinar and can be a helpful tool in re-engaging with your audience. Integration with Outlook and other Microsoft tools. This allows you to streamline invitations and event management with other Office 365 programs. Attendees can watch from many browser types by clicking on the event link. Skype generally supports the two most recent versions of commonly used browsers. Meeting Report provides you with the names, emails, and engagement data of each participant after the webinar is over. This can be helpful for after webinar follow-up with your attendees. Recording options built into Skype Meeting Broadcast. You can set up video on demand so that your participants that may have missed the webinar can watch it after the session is over. Team roles can be helpful if you’re managing a large scale webinar. You can assign roles to the organizer that handles scheduling the event, team members to present, a producer to manage feeds, and set the role for attendees to watch the webinar. Bundled with Office 365. Also available as an add-on for older Office Suites. Pricing available from Microsoft. omNovia specializes in automating your webinar experience. This can be helpful if you need to deliver on demand webinars to your audience. omNovia offers webinar services in different package using their Webinato platform. These packages are based on the number of participants, on-demand views, and usage needs for your webinar. By utilizing the autopilot features, you can repurpose past events, or prerecorded your seminar for use with a recast. The software allows you to add interactive features to engage with the audience and gather data for reporting purposes. Interactive mobile app allows your attendees to view the webinar and interact with chat, polls, and Q&A. Participants can also view the webinar from any web browser. Mobile friendly event registration pages. These can be customized with your branding and can be for one-time or recurring events. Registrants get emailed webinar information and up to two reminders. Three types of recasting options available: individual on-demand, group encore, and fully automated recasting. Group encore allows you to set a time and date for the webinar. You can integrate live events into the recast such as polling, and other forms of participant engagement. Can monetize recasts to set up a revenue stream, or allow your participants to view them free of charge. Server side hosting allows you to scale the number of participants to up to 2,000 per webinar. HD video streaming up to 29.97 frames per second and resolution 700-1280 pixels wide. Add-on features such as Q&A management, co-browsing tools, survey modules, and presentation managers available as well. Pricing packages start at $119 per month on the annual pricing plan for 100 participants per seminar and goes up based on the scale of your webinar. YouTube has continued to be an outlet for creators to share their videos. YouTube Creator Studio gives you several live streaming options for your webinar. These features can appeal to a wide range of users. Using YouTube to run your webinar requires your own channel that can be set up using a Google account. There are a number of features that help you schedule webinars to audiences of different sizes. Using YouTube for your webinar can be an easy way to connect with your audience. YouTube gives you the option of customizing your webinar experience. The quick option uses Google Hangout On Air. This encoder allows you to share materials during the presentation and manage the audience. You can also use other encoder software options to customize the layout. Permanent links allow your audience to go back to the video after it ends. This can be a good option if someone misses your webinar. Stream options give you control over optimizing the latency of your webinar. Lower latency can be a good option where you need to interact with your audience. The tradeoff for lower latency is lower video quality. YouTube also gives you the option of scheduling events for your webinar. Once you create the event, you can customize the promotion message and share the event automatically on Google+ and Twitter. Zoom allows you to host up to 100 attendees for free with a standard account. Webinars under this plan is limited to 40 minute sessions which can be a good option of you’re doing shorter daily or weekly webinars. For recording options, Zoom records the webinars locally on your computer. There is a chrome extension available that allows you to handle scheduling from your Google Calendar or Outlook. You can sync your calendar with your schedule to show open slots in your scheduling for 1 to 1 sessions. Scalable for attendees ranging from 100-10,000 participants. Large scale webinars are view only for participants. Linux and Chrome OS support for hosting your webinars. Webinars can be broadcasted to Facebook Live and YouTube to reach a wider audience. Accessibility features including closed captioning and keyboard shortcuts. The webinars are also compatible with screen readers. Registration and post-webinar reporting tools. Zoom integrates with Zapier and Paypal to allow your to monetize your webinar broadcasts. Ability to split the webinar into 50 separate rooms or less for breakout sessions. This can be a good feature if you want the participants to break up into small groups for activities. Integrates with various business apps to increase functionality. Includes content sharing apps like OneDrive, Google Drive, and others to allow access to your mobile device. There is also integration with marketing and process automation apps to get attendees registered and event reminders. Some examples include Hubspot, Infusionsoft, and other apps. Free account for up to 100 attendees and 40 minute webinars. Pro accounts start at $14.99/month/user with no duration limits. Pricing scales up for when you need more than 100 attendees for your webinars. OpenMeetings is a open source webinar software option that provides both audio and video capabilities. The program can be integrated into your own website using the API, and can be supported on Linux natively. There are 4 audio/video options available: audio+video, audio only, video only, and picture only. You can also control which input devices to use as a source, the camera resolution, and the audio and video quality of the webinar. Various community members have also added integration with different business marketing apps to provide you with leads from attendee registration. Record full sessions (including audio/video sources) and download in AVI/FLV files. Watch and organize webinar recordings using the integrated file-explorer. Each webinar room has public and private drives available. This can be helpful for storing handouts for attendees on the public drive, and you can place files for the presentation on the private drive. Multi-whiteboard can use various tools and display different document file types. You can draw, write, and drag n drop items for attendees to view. Moderation system allows you to tailor permissions for every user. Create and plan webinars using the integrated calendar. Invited attendees will receive an email with webinar details. Private messaging center allows you to manage attendees and send out webinar invites to your contact list. Backup user generated data into zip files for future use. Customize poll questions to engage with attendees during the webinar. Free. uses open source license. How do you choose the best platform for your webinar? Using the right webinar software can help funnel sales, and build up your credibility. No single platform will work for every business, and finding the right one can be overwhelming. Here are some factors to consider when selecting a webinar platform. If you’re running the webinar solo, can you operate the system without assistance? Some software is designed for large scale webinars that have a team assisting the speaker. You want to select on a software that fits the size and style of your team. How big of a webinar are you planning? Many webinar packages scale in cost based on the participants’ you anticipate. You can also consider how often you’ll run a webinar. Some companies will offer discounts for annual subscriptions. This can be a good option if you’re running a schedule of webinars over a period of time. Which companies give you a test drive? A free trial can be a good way of testing out features for your business. It can also give you the opportunity to make sure that the features will be helpful to your webinar. Do you want to monetize your webinar? For some businesses, getting new leads may be the goal of providing the webinar. Some webinar platforms will give you the option of charging for the webinar, while others you will have to download a copy of your webinar for hosting on another website. How will you run the webinar? If you don’t need video options, you can choose from platforms that offer audio services. If you plan on having a co-presenter, you will want to select a platform that allows for multiple hosts. Some examples can include conducting interviews and hosting as a panel. What kind of data do you want to gather from the webinars? If you’re already using a CRM or marketing automation platform, you will want to select a webinar platform that integrates with your business apps. This can be helpful for generating leads and getting information that can be helpful for following up with your attendees. Choosing the right platform means selecting the features that work best for your webinar. Several of the free options can offer a lot of resources to help you reach out to your audience, and can reduce the need to monetize your webinar. At the end of the day, you want to make money off of your efforts. This can come from selling your webinars as content, or indirectly by turning leads into clients. What webinar solutions have worked best for you? What features are “must have”? If you have any thoughts on the webinar options, or you would like to share your webinar experiences, please comment below.